adidas Philippines officially released the adidas Fluid trainer last Saturday, August 14, 2010 6pm at the adidas Sports Performance stores in Rockwell, Greenbelt 3 and Trinoma. They introduced the newest lightweight training shoes that offer full flexibility in every workout. 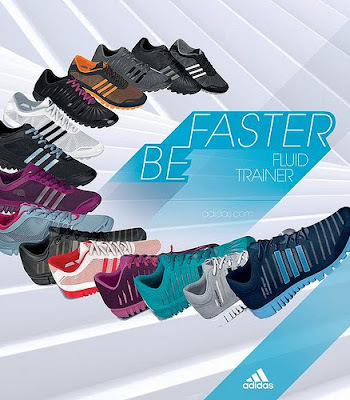 adidas Fluid Trainer has a flexible Fluid Motion features that is designed to work with the foot's natural movement during training or workout. The Fluid Trainer comes in five color combinations for women and four colors for men. This array of colrs makes it easy for one mix and match with any of your adidas training apparel like your men's running shorts or even pair it with your favorite leisure wear in and out of the gym.